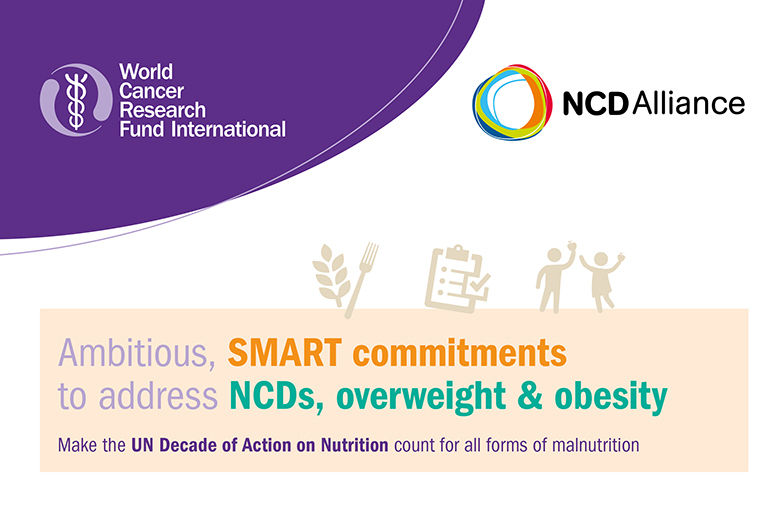 On the occasion of the 69th World Health Assembly, The World Cancer Research Fund International and the NCD Alliance’s are launching a new policy brief: Ambitious SMART commitments to address NCDs, overweight and obesity. The brief is also available in Spanish and French on www.wcrf.org/SMART. Governments are currently off-track to meet global nutrition and NCD targets by 2025. In the context of the ICN2 recommendations, the proclamation of a UN Decade of Action on Nutrition and the 2030 Agenda, the brief ‘unpacks’ the ICN2 Framework for Action recommendations by illustrating how they can be translated into buy tramadol florida concrete, ambitious policy commitments which are SMART: Specific, Measurable, Achievable, Relevant and Time-bound. The example policy commitments are accompanied by case studies from around the world. The brief focuses on select SMART commitments which target overweight & obesity and nutrition-related NCDs. Where possible, policy actions are identified which reduce undernutrition at the same time (so-called double-duty actions). Double-duty actions hold the potential to impact undernutrition and overweight & obesity and NCDs at the same time, as opposed to addressing specific types of malnutrition in isolation. Double-duty actions should be prioritised by governments and donors.